This week, Kristen of Buck up, Buttercup is going to open up the week for us with her contribution to the 12th edition of The Monday Snapshot – an evolution of the MMM feature, meant to bring the PAIL blogroll to life by giving its members a chance to feature themselves and make new connections. If you would like to be featured on The Monday Snapshot, please sign-up here! Hi Everyone! Happy Monday! Hope all the Americans had a nice Thanksgiving! I’ve been blogging 2 years as of October 2012. In the months before I started, I’d been traveling for work a great deal/working insane hours to pay for fertility treatments, and I needed a creative project that was just for me and just for fun. I tried to get pregnant back in the 1990s with no success (and no trips to the doctor to figure out what was wrong). Started trying again in 2007 and endured 2 surgeries, 5 IVF cycles (4 fresh, 1 FET), 2 chemical pregnancies, 1 late miscarriage, and finally, finally had twins in March of 2012. I am super outdoorsy (or was before my kids were born, and will be again). I have a successful work-at-home business…trying to combine the best of the working mom and stay-at-home-mom worlds. I’ve also dealt with the devastating loss of my brother and best friend being killed at age 27 (and when we were living together), so I have a lot of experience with grief in addition to what I went through with infertility. I love the blog Dear Baby such a sweet portrait of motherhood. As always, we want to see your Monday Snapshot as well, so please comment below with a link to your post– and of course, go visit Kristen at Buck up, Buttercup ! « weekly summary, vol 25. What a TOTALLY sweet pic of the twins! I can’t imagine losing my brother and BFF at such a young age. Wow. That picture is SO great. Their little hats and outfits, the scenery, the pose – LOVE it! I need to keep an eye on your blog for tips from working from home… I’m part time from home, part time in the office and working from home is a challenge! aww! they are so sweet! And another Luke 🙂 yay! 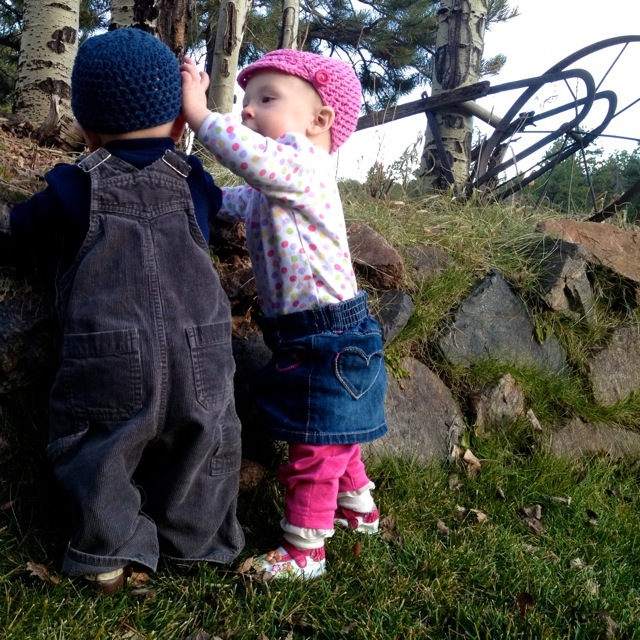 I love that picture….twins interacting and creating those moments to warm the heart…great capture! So nice to meet you Kristen!! 🙂 What adorable little twins you have! Love their matching hats. I can’t imagine losing a best friend and brother at such a young age. Must have been so tough. I am sorry. I love their hats – too cute! What a great picture – SO cute!! Twins kill me. Double the adorableness! And those hats!! Such a great picture, I love capturing kids doind their own thing and not posed, perfect! What a journey for you to get those precious babies! I love the picture!